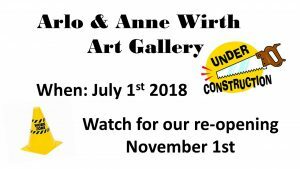 The Wirth Art Gallery will be closed and under construction starting July 1st. fireplace console, pub table and coffee bar.It will also house a permanent black and white photo display of Hartington landmarks. We would like to thank the public for the support of the gallery over the years. The library has showcased over 80 art shows and featured 120 local and regional artists since it’s opening in 2002.